Numerous studies have shown the white kidney bean's effectiveness in neutralizing carbohydrates. This is done by binding to the enzyme alpha-amylase, produced by the pancreas. Early studies of white kidney bean's extract effects on weight loss were not promising, until one well-designed study published in the "International Journal of Medical Sciences" in 2007. Researchers looked at the effects of taking 455 milligrams of an extract of white kidney bean, or Phaseolus vulgaris, on 60 slightly overweight subjects versus taking a placebo. The subjects also consumed a carbohydrate-rich diet. After 30 days, subjects taking the extract experienced significantly greater reductions in body weight, fat mass, body mass index and waist, hip and thigh measurements. They also maintained lean muscle mass, which is essential for a healthy metabolism to burn more calories. Considerations - Always Use 100% Pure There are a few reasons earlier studies showed poor results for white kidney bean extract products, according to NYU Langone Medical Center. For instance, another enzyme, glucoamylase, can take over when amylase is blocked. Also, a low dose may not be as effective. In general, starch blockers are considered safe to take, notes the Center, but your doctor can provide more guidance on taking them. When given to people who are not otherwise on a diet (during their highest carb containing meal), white kidney bean extract is able to reduce body weight and body fat levels similar to simple caloric restriction. ►NATURAL APPETITE SUPPRESSANT & CARB BLOCKER Always PURE Always FRESH. Phaseolus vulgaris white kidney bean extract weight loss pills are a phase 2 carbohydrate Inhibitor a STRONG carb blocker helping you LOSE WEIGHT FAST. 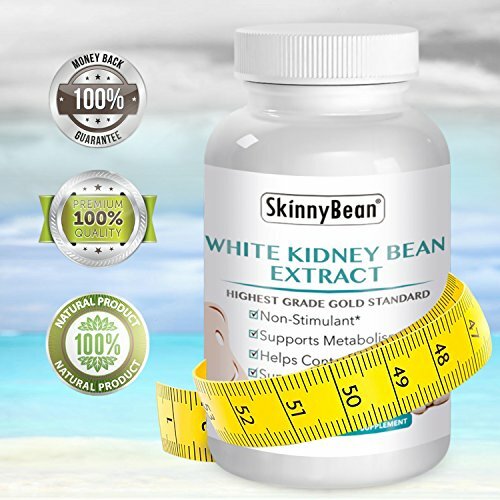 ✅ STIMULANT FREE ★ White Kidney Bean has been proven in some trials to aid in weight loss and to promote appetite suppression, so it's the perfect product to kick start your weight loss journey, or to take every day to support your health and diet. It's stimulant free, and has no reported side effects.